Unsure whether PEAXACT should be your future software tool for quantitative spectroscopy? This article lists typical questions and answers, grouped by topics. Q: There is a bunch of tools for multivariate data analysis available. Where does PEAXACT find its place? A: PEAXACT is not just another software for arbitrary multivariate process data. PEAXACT is designed and optimised for spectroscopy, meaning that we treat a spectrum as what it is – an array of coherent intensity values, to which nature has given a characteristic appearance like peaks, bands, landscapes etc. Why should we blow up this structure into pieces by treating it like any generic set of multivariate process data? Q: What is so specific about PEAXACT? A: PEAXACT extends the toolbox for spectral analysis with the so-called Spectral Hard Modeling methods. Obviously, first choice should always be a univariate approach, e.g. Peak Integration. Unfortunately, they frequently fail due to signal overlap, and in this situation Hard Modeling allows us to resolve the overlapping ranges by fitting pre-defined peaks. Since these peaks have been obtained from the pure component spectra, their intensity is directly correlated to their concentration! The good thing is that a Hard Model can be made as flexible as required e.g. in case of shifting peaks, shape changes etc. Once the shape of the mixture spectrum is correctly captured by the Hard Model, the quantification is independent of these changes! The performance of such a Hard Model can easily be assessed by the spectral fit error: does the model properly fit to the spectrum, and if not – where? Q: Is Hard Modeling universally applicable? A: Well, obviously, the spectrum has to be peak-shaped to apply a peak-based model. But this is true for many spectroscopic techniques, including Raman, mid-infrared or NMR spectroscopy – even GCs! And if model-driven methods like Peak Integration or Hard Modeling fail, you can still apply data-driven methods like Partial Least Squares (PLS) out of PEAXACT! Q: But doesn’t it easily get complex to analyse complex mixtures with a Hard Model? A: Sure. Complex spectra with myriads of peaks need careful handling. But anyway, you are free and welcome to reduce the spectral ranges that you use for the analysis – reducing the number of peaks, reducing complexity, enhancing reliability. We have a case where we don’t use more than a 200 cm-1 window for a full analysis of 6+ components with a Hard Model! Q: PEAXACT is a relatively new product. Why should customers switch from an established product to PEAXACT? A: PEAXACT is already an essential part of the PAT tool boxes in major PAT groups in the (Petro-)Chemical and Pharmaceutical Industry, in research institutes and universities, and in SMEs. 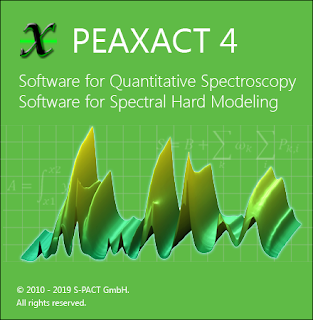 PEAXACT users appreciate that the software provides all relevant methods for spectral analysis, powerful visualisation tools, and excellent support of the modelling and analysis workflow. No surprise that manufacturers like Kaiser Optical Systems or tec5 will recommend PEAXACT for their spectroscopic devices! Q: In the past, I have been creating my own particular methods in MATLAB or R, or using free-of-charge software. Why should I switch to PEAXACT? A: Remember that a commercial software like PEAXACT comes with professional maintenance and documented upgrades, unit testing, communication interfaces etc. You can rely on proven quality and make sure you efficiently use your time for the analysis of spectra, not for debugging your private code! By the way: Even our most "curious" customers will confirm that we are efficiently supporting your custom tools in PEAXACT environments, even considering to integrate them into our own future development! Q: How compatible is PEAXACT with instrument and automation software? A: Running PEAXACT models from a measurement software or as a part of an automated monitoring system is pretty easy through the PEAXACT Application Server. This is based on .NET dll-type interfaces, and these interfaces can be easily attached to a measurement e.g. in HoloPro from Kaiser, OPUS from Bruker or tec5’s MultiSpec Pro II software. LabCognition’s Panorama is equally suited, and as a third-party tool already combines multiple vendors’ instruments with spectra processing. If the analyser is already implemented in automation systems like Siemens, synTQ or LabVIEW, MATLAB, other systems, then the PEAXACT Application Server can be directly interfaced from that side. Q: What if I do not have an instrument providing a communication interface? A: Nothing easier than that! PEAXACT can be extended with PEAXACT ProcessLink, which is an extremely easy-to-use tool based on folder monitoring which can sit on top of any spectra-generating device. It helps to turn even “autistic” instruments into process analysers! Q: How can I learn PEAXACT quickly? A: Don’t be afraid. Of course, learning a new tool always takes more efforts than using the one you got used to already – but it will pay off! Through our blog we provide tutorials and short lessons, but the best is always to have personal contact with the support people! We invite you to do so. We can schedule a web demo to let you start into PEAXACT, but the most popular way to implement PEAXACT as a tool is our two-day on-site training for you and your PAT group. Most of the time will be spent in practical exercise, meaning that you have two supervised days of learning how to operate PEAXACT. Be sure that on day 3 you will be able to create models on your own! Q: I might get stuck with Hard Modeling or other PEAXACT-specific issues later. How can you help me out? A: We are at your side to support your modelling at any time. Please contact us so that we can arrange for a Remote Support session on your specific problem! If you rather feel like giving away the modelling task to us, we will be happy to take that over. Depending on the size of your modelling project, we will offer you one of our Analyzer App products, allowing you to start right through with a validated analysis model!